Hugh Chaplin was born 22 May 1603 in Bradford, West Yorkshire, England. His parents were Ebenezer CHAPLIN and [__?__]. He emigrated with his wife Elizabeth. in the summer of 1638, towards the end of the Great Migration with Rev. Ezekiel ROGERS and his followers on the ship “John of London” from Hull England. He married Elizabeth SCOTT. about 1642 in Ipwich, Mass. He was almost forty years old when he married and his bride was twenty years younger. Hugh died on 22 Mar 1653 in Rowley, Mass. Elizabeth Scott was born in 18 Nov 1623 Rattlesden, Suffolk, England. Her parents may have been Thomas SCOTT and Elizabeth STRUTT. 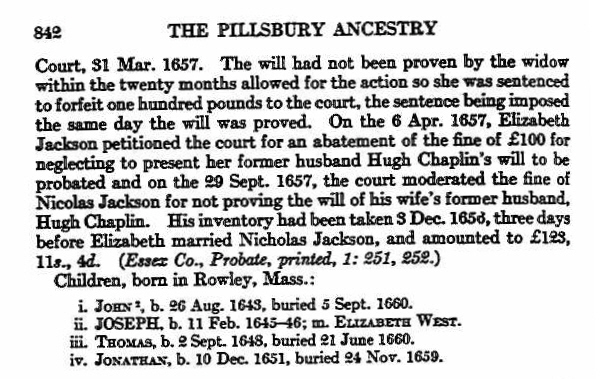 After Hugh died, she married our ancestor Nickolas JACKSON in 1656. Elizabeth died on 12 Jun 1694 in Rowley, Mass at the age of 89. Some sources say Elizabeth Scott married in Rowley, MA in 1647, John Spofford, from an ancient Yorkshire family (pre-dating 106, according to the records). John Spofford was the son of another John Spofford, who, in 1662, lost his ministery in Silkston, Yorkshire for “non-conformity.” He was, of course, a Puritan. A daughter of John and Elizabeth (Scott) Spofford, Sarah Spofford, born 22 Mar 1661-2, married Richard Kimball(3). The passengers on the Elizabeth were very much an inter-related group; it also included Munnings, undoubtedly related to Richard Kimball. Three of Hugh’s sons died within ten months of each other in 1659 and 1660, doubtless of some prevalent children’s disease, for the Vital Statistics of Rowley show that thirty children died there in that period. Wife Elizabeth and second son Joseph thus became the residual heirs. In the summer of 1638, towards the end of this great migration from the England of Charles I, Rev. 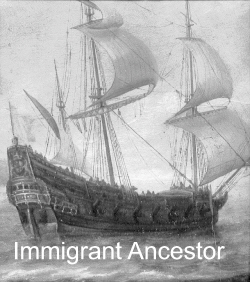 Ezekiel Rogers and his followers set sail on the ship “John” from Hull England. 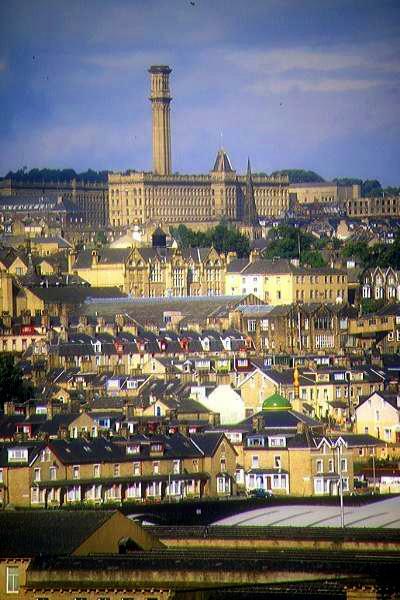 On board were about twenty families, nearly all from Yorkshire, under the leadership of Rev. Rogers of Rowley, England, near Hull. Among the families were Frances Lambert, from Holme-on-Spaulding-Moor; Edward Carleton, from Barnston; Hugh Chaplin, Maximillian and Joseph Jewett, from Bradford; Robert and John Hazeltine, from Biddeford in Devon; William Jackson, from Rowley, and William and John BOYNTON, Thomas Nelson, John Spofford and Thomas Tenney. The ship landed in Salem Harbor where they stayed the winter and spent the time looking for a more permanent location to settle. Rev. Rogers appeared before Mr. Wilson’s church of Boston in the year 1638 and requested for himself, and his people, to join with Mr. Wilson’s church. His request was granted. Rev. Rogers was urged to join a company, being formed to colonize Quinnipiack, now New Haven, Conn., but chose not to go. Before the winter was over Ezekiel Rogers request of the General Court, a tract of land between Ipswich and Newbury. His request was granted and the settlement began in the spring of 1639. By 1645, sixteen additional families had arrived in Rowley, including James Bailey, Nicholas JACKSON, and John PEARSON. Hugh Chaplin became a Freeman in 1642, and most of the others soon followed. Previous to 1664 a Freeman meant that they were members of some Congregational Church and had taken the Freeman’s oath, and were entitled to vote. Here is today’s approximate location of Hugh’s lot on Google Maps. Although the first mention of the new plantation was in March of 1638, it was not incorporated until September of 1639. Hugh Chaplin was a respected citizen of Rowley, served the term of 1648 as juror in Rowley; served on the trial jury and was Overseer, 3, January 1650 and again 19, December 1641. Hugh had four boys, all born in Rowley. Three of his sons were minors at the time of his death. The lots that were Hugh’s in later divisions, were given to his heir and only living son Joseph, in his father’s right. 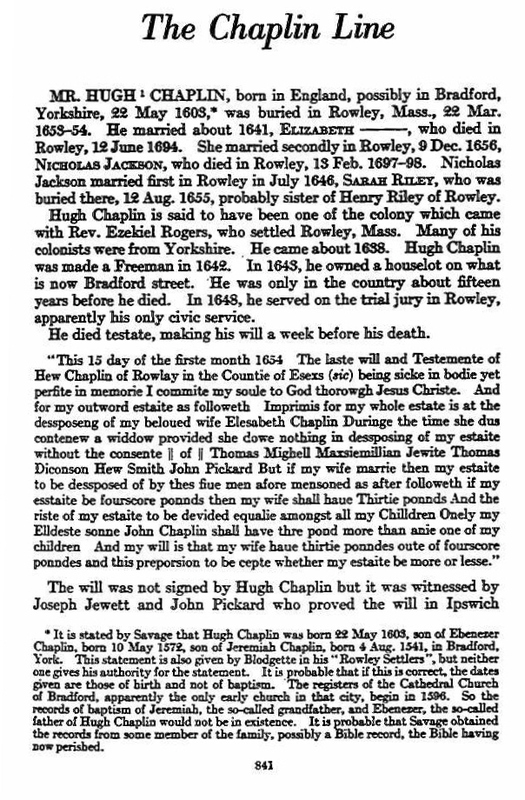 Hugh Chaplin only lived fifteen years after settling in Rowley, he died testate, making his will a week before his death. Hugh did not sign his will, but it was witnessed by Joseph Jewett and John PICKARD, who proved the will in Ipswich Court, 31, Mar 1657. The will had not been proven by the widow within the twenty month allowed for the action, so she was sentenced to forfeit one hundred pounds to the court. On 6 Apr 1657, Elizabeth Jackson petitioned the court for an abatement of the fine of £100 for neglecting to present her former husband Hugh Chaplin’s will to be probated and on 29 Sep 1657, the count moderated the fine of Nicholas JACKSON for not proving the will of his wife’s former husband. This 15 day of the firste month 1654. The laste will and Testemente of Hew Chaplin of Rowlay in the Countie of Esexs being sick in bodie yet perfite in memorie I commite my soule to God thorowgh Jesus Christe. And for my outword estaite as followeth. Imprimis for my whole estate is at the dessposeng of my beloyed wife Elesabeth Chaplin Duringe the time she dus contenew a widow provided she dowe nothing in dessposing of my estaite without the consente of Thomas Maghell Maxiemillian Jewite Thomas Doconson Hew Smith John Pickard. But if my wife marrie then my estaite to be dessposed of by thes fine men afore mensoned as after followeth if my estaite be fourscore pounds they my wife shall haue Thirtie pounds And the riste of my estaite to be devided equalie amongst all my Children Onely my Elldeste sonne John Chaplin shall have thre pound more than anie one of my children. And my will is that my wife haue thirtie poundes oute of fourscore poundes and this preposion to be cepte whether my estaite be more of lesse. 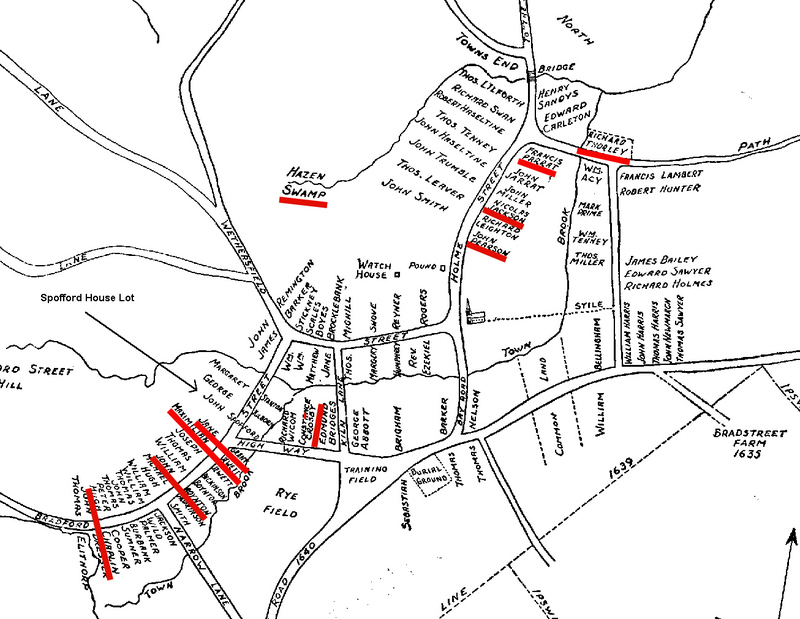 Hugh had a grant of an acre and a half of land for a house lot in Rowley, Massachusetts, on what is now Bradford street, and there he built his house, which [as of 1922] it stood and was in good good repair. He was made freeman in 1642, and according to the history of Rowley he was a surveyor of land, and was included in the list of men of that ancient plantation of whom it is written that they all were “godly men of good estate.” Hugh Chaplin died in Rowky, and was buried there 22 1 mo. 1653. His will, written with his own hand, is on file in the Court of Probate in Salem, and gives evidence that he was a man of educational attainments. 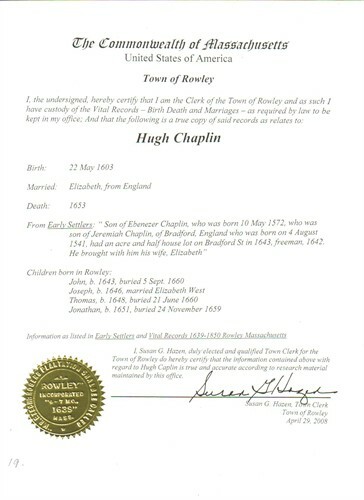 Hugh and Elizabeth Chaplin had four children, all born in Rowley: 1. John, born August 25, 1643, buried September 5, 1660. 2. Joseph, of whom further. 3. Thomas, born September 2, 1648, buried June 21, 1660. 4. Jonathan, born December 10, 1651, buried November 24, 1659. This entry was posted in 12th Generation, Historical Site, Immigrant - England, Line - Miller, Pioneer, Public Office and tagged Rev. Ezekiel Rogers, The John of London 1638. Bookmark the permalink. Coat of Arms removed. In reality, Hugh Chaplin was not part of the gentry and did not have a coat of arms when he came to America.